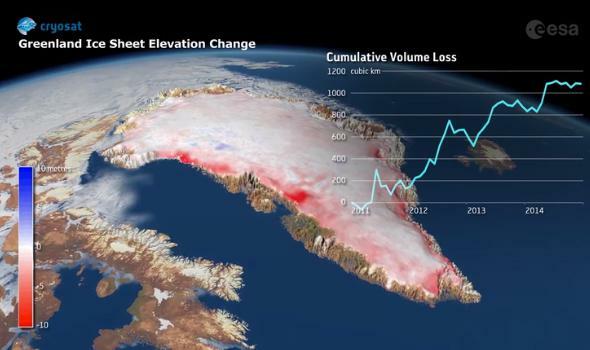 Greenland lost a trillion tons of ice in four years. While the world warms, Greenland melts. A new paper just published by scientists in Geophysical Research Letters presents results of their investigation into the ice sheet covering Greenland. They found that over the four-year period from Jan. 1, 2011 to Dec. 31, 2014 Greenland lost over a trillion tons of ice. These numbers are staggering. To give you a sense of scale: A trillion tons of ice would make a cube over 10 kilometers (six miles) on a side. That’s taller than Mt. Everest, and would have about three times that mountain’s volume. And that much ice disappeared from Greenland in just four years. But no, really, it didn’t disappear. It had to go somewhere. And where it went was into the ocean, adding water to it. Distributed over the Earth, that means sea level rose about 2.5 mm over those four years. That rate of sea level rise from Greenland ice melting was twice as rapid as the average rate from 1992-2011. I’ll note that 2012 was unusual across the Arctic, with far more warming than usual, less snow cover than usual, huge sea ice losses, and higher loss of Greenland land ice as well. But even with that, the trend is, dare I say, alarming. Mind you, that’s just from Greenland, and doesn’t include melting from Antarctica, which is occurring at about half the rate of Greenland (the Arctic is more prone to warming and melting that the Antarctic). Every year, these two land masses lose about 400 billion tons of ice combined, draining it into the ocean, causing sea level rise. This fresh, cold water also disrupts critical current flow that transports heat from the Equator to the poles, and cold water back again. This may also affect the jet stream, which in turn gets weaker, allowing frigid Arctic air down to lower latitudes in the winter. Common in this situation is the formation of stalled “blocking patterns” in summer that prevent storm systems from moving easily, bringing droughts in some areas and floods in others. In 2013, a torrential downpour in my home of Boulder occurred because of one of these blocking patterns, and the results were horrendous—some places got nearly half a meter of rainfall in a few days. That same year, Alaska had a terrible heat wave, again due to these blocking patterns. The evidence that global warming is behind all this is so overwhelming is difficult to overstate. But I’ll note that the likely Republican nominee for President calls global warming a hoax, and his Vice Presidential pick called it a myth. I’ll also note that the Democratic likely nominee not only acknowledges the reality of global warming, but also has a plan in place to deal with it. I could wish for something more aggressive from her, but given the infuriatingly sorry state of the GOP attitudes about science and reality, this is a case of taking what you can get.